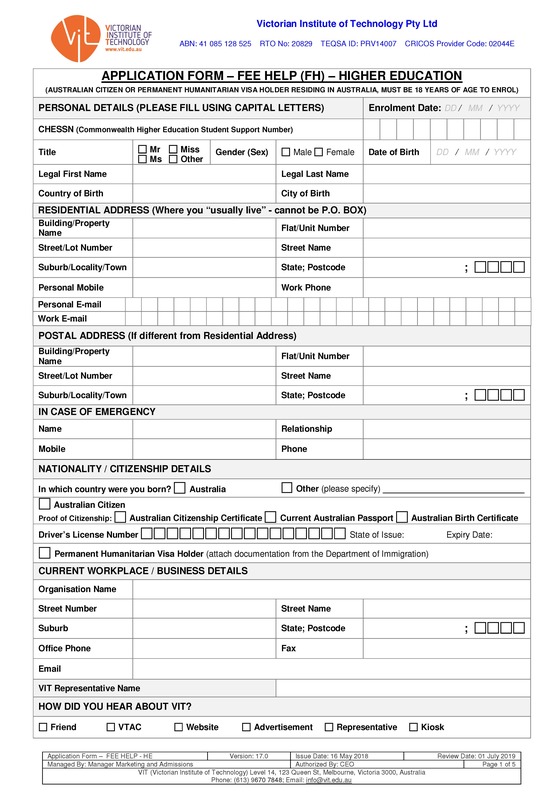 Victorian Institute of Technology (VIT) is a premier dual sector Registered Training Organisation (RTO NO: 20829) offering higher education and vocational courses. IT has established a sound reputation in domestic and overseas markets for delivering quality education since 1998. The inner-city Melbourne locations are conveniently close to major shopping, restaurants, entertainment centres and well serviced by public transport. 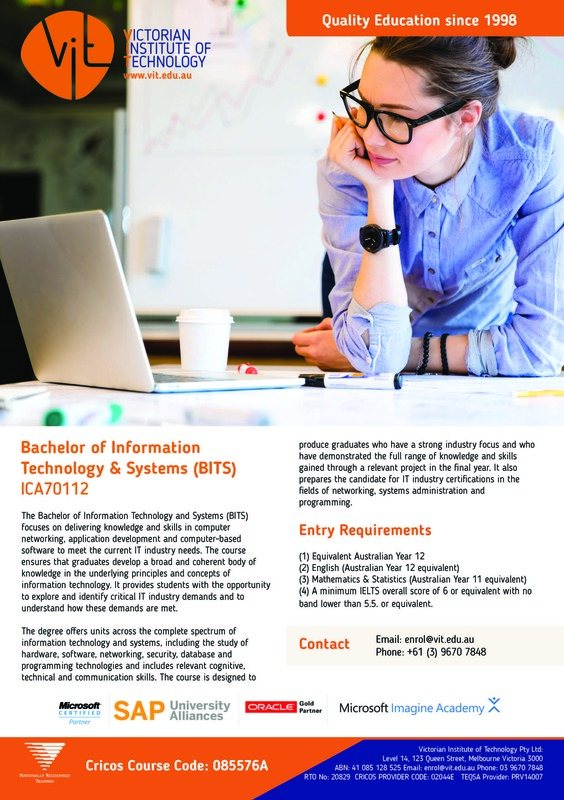 VIT offers quality higher education through its Bachelor of Information Technology and Systems (BITS) program, facilitating a pathway for Diploma of IT (Networking) students into the higher education course. VIT is a specialist in the IT sector; shown through its accreditation as a SAP University Alliance Program member, Oracle Gold Partner, Microsoft IT Academy Program Member, and Microsoft Certified Partner since 2000. 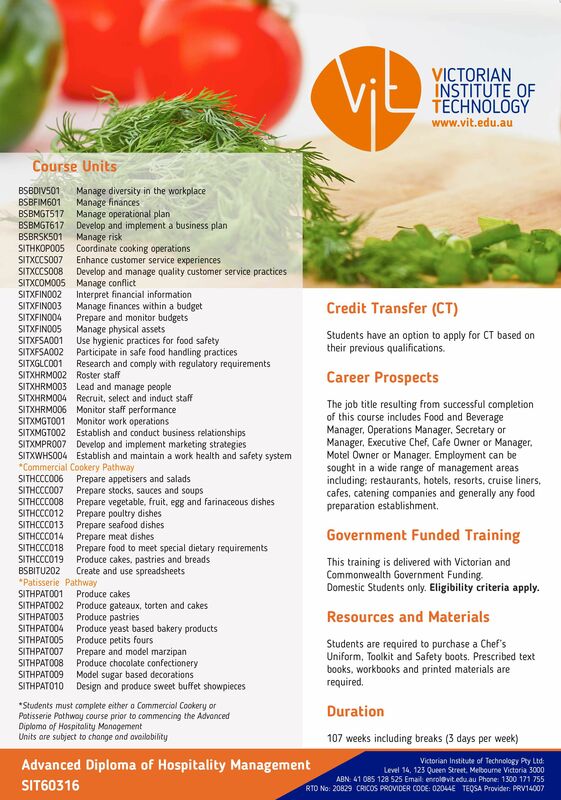 VIT also specialises in a range of accredited vocational programs in Information Technology, Commercial Cookery, Patisserie and Hospitality. The courses focus on industry needs and provide graduates with the qualifications and skills to meet the needs of the workplace. VIT qualifications are recognised by professional industry bodies: Tertiary Education Quality and Standards Agency (TEQSA Provider No: PRV14007); Australian Skills Quality Authority (ASQA) and the Department of Education. VIT students have access to excellent facilities and resources, including, fully equipped kitchens, workshops, audio-visual equipment and personal computer labs. VIT's resource centre includes a Higher Education electronic library that allows students to access over 1,000 full-text e-Journals, plus 2,500 e-books. VIT has credit transfer arrangements with several universities, and is working towards similar arrangements with additional universities around Australia.